I've got a cat problem. Somehow, through some strange power unknown to me, I've managed to attract every neighborhood stray to the hood of my truck. They pee on my tires and the bushes in front of my house, taunt my dog as he barks, helplessly from inside the living room window, and on more than one occasion, I swear at least one of them has flashed me an evil smile as it walked slowly out of my yard in the middle of the night. Fed up with the infestation, I borrowed an animal trap from a friend and caught me a cat. I caught the cat because I was told there is no service for picking up strays in my town. I called every humane society branch within three counties only to be told that they are not currently accepting cats but they would be happy to put me on a waiting list. In desperation, I called the dispatcher for the local police department to ask if they could do anything. The dispatcher answered my question short and rude, obviously suffering from a lack of morning coffee and some prior social education, and preceded to say "We ain't got no ordinance for stray cats." She went on to tell me that, if I found an animal dead on the road, they could send someone to come pick it up. Hmm, I thought, But I knew I couldn't follow through on such a despicable plan. Well I've been catching cats for a week now-one a day. Let's just say that I'm trying to provide them with a good home in the country. Hey, don't judge me. I did everything I could short of providing a pillow and a scratching post for the flea-bitten varmints! Besides, were talking property damage here. These cats have scratched the paint and rubber on all of our vehicles. 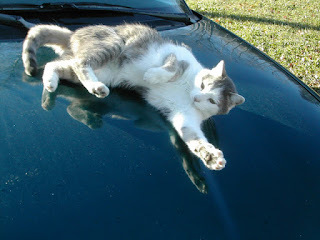 Back in the old days one could rid themselves of cats by simply starting their vehicle first-thing in the morning. This is no longer an option with electric fans and tight engine compartments. Don't get me wrong, I'm not a mean person. 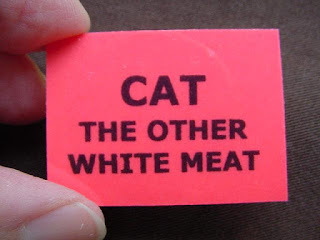 I love cats, they taste like chicken! Just kidding, although one never knows. I've eaten food in enough third-world countries that I have learned to refrain from asking if something doesn't taste quite right. Anyway in keeping true to myself, I just couldn't let it go. Since I could find no help in the local community, I wrote a very long poem/ballad about it. If anyone asks me, I'll claim the characters and events are purely fictional. I've tried to conform, if only barely, to the standard ballad format. That is, four-lines (quatrain) with the first and third line; second and fourth line emphasis. "A workin' truck, it ain't"
"Get off my damn truck, you mangy flea-bitten feline"
The shelter refused saying "can you call the cops instead?" So, he called the dispatcher with a "please, come take a look?" The dispatcher gave him a hush saying "We don't care of your woes"
"Don't you see, we've got no ordinance for cats"
"find your own plan, round here, that's just how it goes"
He thought of the cat "I'll learn him from giving me crap"
Saying "Son, what you trying to pull? We got an ordinance for guns"